Having seen his father killed in a major gang fight in New York, young Amsterdam Vallon (Leonardo DiCaprio) is spirited away for his own safety. Some years later, he returns to the scene of his father's death, the notorious Five Points district in New York. 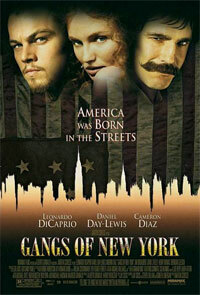 It's 1863 and lower Manhattan is run by gangs, the most powerful of which is the Natives, headed by Bill "The Butcher" Cutting (Daniel Day-Lewis). He believes that America should belong to native-born Americans and opposes the waves of immigrants, mostly Irish, entering the city. It's also the time of the Civil War and forced conscription leads to the worst riots in US history. Amid the violence and corruption, young Vallon tries to establish himself in the area and also seek revenge over his father's death. 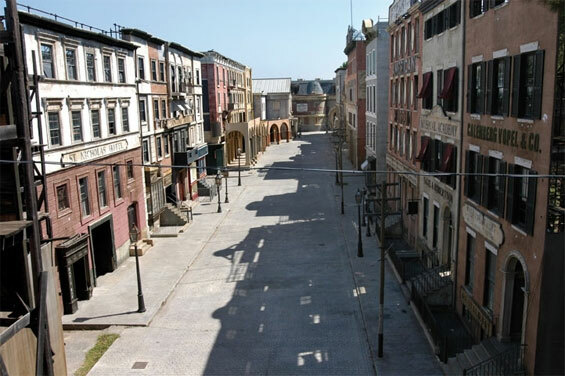 otsoNY Comments: Although the film is set in New York, the actual filming took place at Cinecittà Studios in Italy. 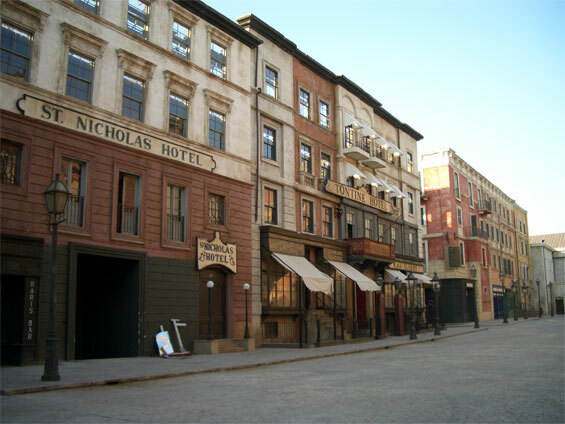 An entire set was constructed to resemble what New York looked like in the 1800s. Clever computer-trickery is used in the final sequence as Leonardo DiCaprio’s character Amsterdam Vallon stands alongside his love-interest Jenny Everdeane played by Cameron Diaz, seen on the outskirts of Brooklyn within a small fictional cemetery. As the two characters leave the cemetery, the timeline is rapidly increased and the changing skyline of Manhattan can be seen evolving. Cinecittà Studios, Cinecittà, Rome, Lazio, Italy.